Let’s talk fuel belts. I have major overheat issues and need water even on 5k runs (which is all I’ve worked up to right now LOL) if it’s over 70 or so. I picked up a Nathan triangle that has a single large bottle tipped on an angle. It bounces around more than I’d like (one of my coaches said cinch it until you have a muffin top…. hello) and it’s tipped to the right for right hand pull from the back and I’m left handed so I’m not the most graceful with it. Looked at some of the 2 and 4 bottle waist belts but in a quick store test, it seems like my arms will hit them when swinging, especially the 4 bottle. Any thoughts? Stashing ahead of time isn’t an option. I tried on a 2 bottle one that was 10oz each, apparently there are 10s, 7s and a smaller one. And I also think I like the ones with the clip close belt vs the velcro but could be swayed. I just have to accept that with my stomach and upper waist bulge, it may not look pretty and cute but I can’t be concerned with that. 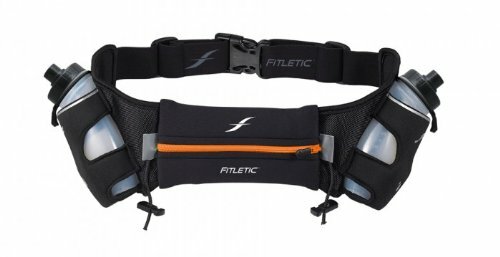 I just ordered this Fitletic belt. My daughter has one so I was able to try it, and it feels great, plus has a nice pocket for accessories. She swears by it’s comfort, and I can’t wait to get mine. 🙂 It’s hard to see from the pic, but the band that this one is built on just feels so good, and it stays put – it doesn’t bounce around and move. I also have a Fitletic belt and love it! It’s very comfortable and fits well with minimal bouncing around. You can also order extra bottles that slip on and off easily. Why not try a hydration vest? Nope! No hitting the bottles on arm swing. The bottles aren’t as out to the side as they appear here…it feels great. None of the hydration belts/ packs fit my very petite frame. I run with a water bottle in my hand. I switch off during the run as necessary. I started my half marathon with a bottle in each hand. Ha! I carry my bottle. I don’t mind running with it in my hand. During races they will refill at water stations. Take a look at UltrAspire Spry only 1liter. Just got one myself and really like it. Forget it’s there. My coordination level at this point is pretty low since I’m so focused on my feet lol! I thought about a hand bottle but I know that would annoy me personally. And things with shoulder straps… I don’t know. Worth looking at I suppose. Keep the suggestions coming. I have a muffin top and run with this 4 bottle, I have no issues and can move it up or down. I bought the strap adjustment to make it bigger because I bought it smaller than was comfortable. It works awesome and after a bit I dont even notice I am wearing it. that’s like one of the ones I was looking at but it felt like my arms were rubbing on it. Mine dont, I am short and have bad form too lol. My arms never touch my 4 bottle Nathan hydration belt. I love it. And wear it a few times a week. I have the 4 bottle fuel belt as long as it’s tight enough it stays in place. But I also often run with just a bottle of water and/or Gatorade switching from hand to hand as I go. 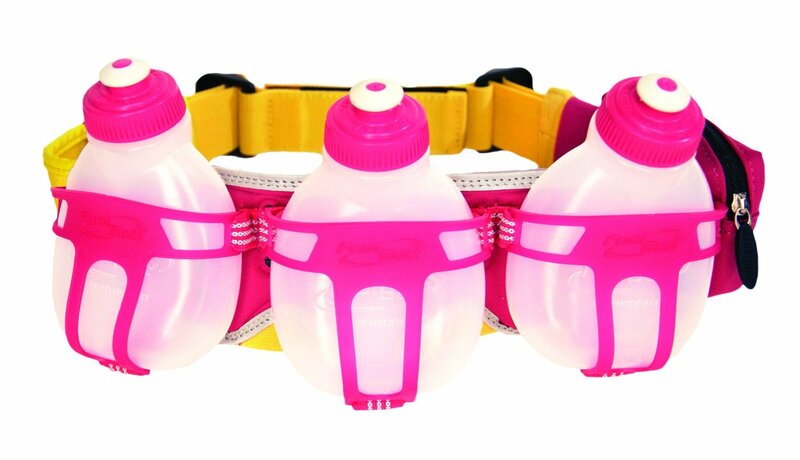 I just purchased a Nathan two bottle hydration belt. I really like it and I’m glad I went with that over the one bottle (I was debating in the store). The employee said most people prefer the two bottle over the one because the weight is more balanced. For the first mile or so it was a big awkward to run with, but that’s because I didn’t have it tightened enough. Once I tightened it, it was super comfortable and not an issue at all! I can fit my phone in the pocket, too, which is nice because I use that for my music. I use the hydro backpack and love it! Then I have nothing around my waist! I feel like if your concerned about your arms rubbing the bottles on a hydration belt your form needs work or your wearing the belt to high. I have the same nathan pack and wear it up around my ribs more like a backpack and It got rid of the bounce issue. 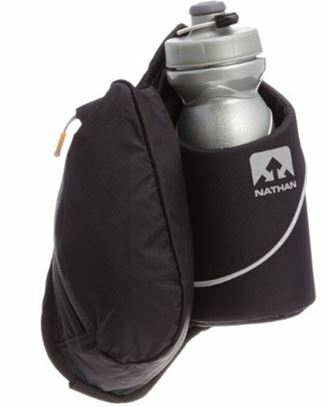 I have the same Nathan pack and wear it with the bottle on my back. No issues with bounce at all. I use a 2 bottle Nathan belt, my arms never bump the bottles. If I’m running 5 miles oil just fill each bottle with a couple ounces if I’m doing 20, I’ll fill them right up and make plans for a refill someplace. I’m really happy with it. The one con for me is that I can’t pack a ton of snacks because I bring my phone, and an epipen and snacks, so sometimes on long runs I have to wear my spibelt also. This entry was posted in Question and Answers by Runners and tagged Fuel Belts.